How do I buy tickets to NYCC? 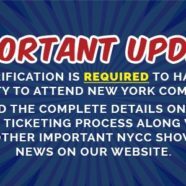 In an effort to deter the rampant scalping of tickets that has plagued New York Comic Con in recent years, show promoter ReedPop has announced some big changes the NYCC ticket buying process for 2016. The biggest news is the implementation of the new Fan Verification System. Similar to the system that is in place for tickets to San Diego Comic-Con, this new system requires that everyone who desires to buy a ticket for NYCC first set up a user profile. That profile will be good for buying one ticket for each day of NYCC. For example, Groot wants to buy tickets for Friday, Saturday and Sunday. He could either buy one 3-Day Pass or buy individual tickets for Friday, Saturday and Sunday. What he won’t be able to do is buy both one 3-Day Pass and one Saturday ticket, because that would violate the one ticket per day rule. What if you need a friend to buy you your ticket? That’s not a problem, as long as you first set up your Fan Verification profile and give your friend the email address attached to that profile. For example, Rocket needs Groot to buy him his ticket. Groot wants a 3-Day Pass and Rocket wants tickets for Saturday and Sunday. Once ticket buying begins, Groot puts in an order for tickets, and associates his profile for his 3-Day Pass and Rocket’s profile for Rocket’s Saturday and Sunday tickets. This will all be done on one order. When are tickets going on sale? We don’t know yet and NYCC has no plans to publically announce when tickets go on sale. Fans who set up a Fan Verification profile will be emailed with the timeframe in which they can buy tickets 48 hours before they are able to purchase tickets. Monitor your inbox closely! Do you usually buy your NYCC ticket at Midtown Comics? You won’t be able to this year. Newly announced for 2016 is that online will be the ONLY place to buy your ticket. We were headed in this direction over the past few years, as comic books stores allowed to sell NYCC tickets dwindled until it was only Midtown Comics. I’m guessing Midtown Comics doesn’t mind losing out on selling NYCC tickets. I have no idea what their commission was for tickets sold, but the managing of that line that stretched blocks and saw people lining up a full day before tickets went on sale was a daunting and thankless task. Plus, getting rid of retail sales makes it harder for the scalpers. Last year, there were reports of scalpers paying people to stand in line for them and then fronting them the cash to buy the max number of tickets. Another big piece of news, but one that only affects a small segment of NYCC attendees: There will be no VIP tickets this year. If you’re someone who buys VIP tickets every year, this is huge news. Despite their cost, VIP tickets were always the first to sell out every year. The tickets were pricy, but had nice perks baked into them: exclusive signing sessions with top creators like Scott Snyder, the ability to get onto the show floor before other fans, and a VIP lounge where you could rest up and check your coat and bags. I’m surprised NYCC is getting rid of these tickets, but my guess is that with the new rolling tickets buying process, getting rid of the VIP tickets was easier than figuring out a way to allocate such a small number of tickets for each on-sale session. The big question is: will the new fan verification process work? Will it stop a large segment of scalpers? On the one hand, what’s to stop scalpers from creating dummy email accounts and fan profiles to still buy lots of tickets? Under the new system, if a scalper wanted to buy 12 tickets, he would need to make 12 separate email accounts. And really, how hard is that? On the other hand, by requiring the Fan Verification profile to be setup in advance, NYCC is knocking out the scalpers that are late to the game, the ones who jumped on NYCC ticket sales day-of because they heard they were easy to flip. Yes, there are more hurdles to climb to buy a ticket. The new NYCC ticket buying process seems more stress inducing than before. But hopefully it works, and tickets end up in the hands of fans, not scalpers. Overall, I think these changes will be for the better and not for the worse. Good luck, everyone. We hope to see you at NYCC. 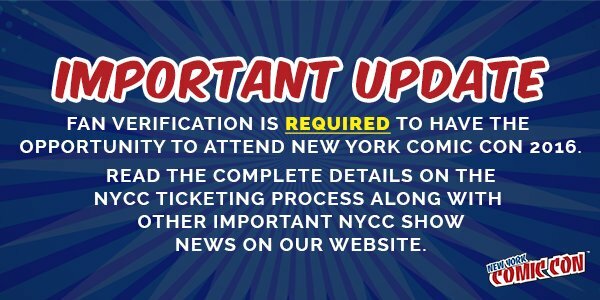 More information on the new NYCC ticket buying process can be found at the official New York Comic Con website.